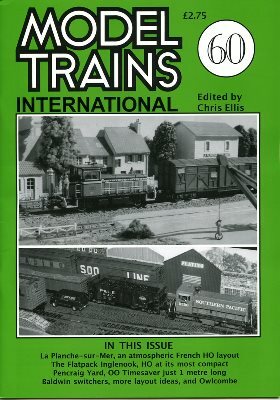 Editor muses on ten years of Model Trains International and recalls the history of its predecessors. SNCF Society proposed a continuous run N gauge layout to promote the group and so an HO Branchline line came into being! 5ft 9in x 1ft 3in. Description and drawings of typical American diner, that also suits many other settings. Photographs of French seaside lines and locations. A OO 'classic' GWR terminus built in 1972. Planned as a lightweight easily transported layout it was built on two boards 4ft long plus a fiddle yard using Firmway/Chairway track with scratchbuilt structures and simple scenics. Two N gauge plans set in American industrial locations. Photographic essay portraying actual examples of American lineside industries that could inspire those with an odd area of space on their layouts. Baldwin VO series switchers and HO models described with ideas for detailing. Pacific Electric in South California; overhead wire powered line serving citrus packing houses. Plans and photographs of American side and end loading platform.